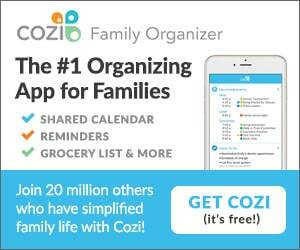 I am so excited to share with you a project that I have been wanting to do for a long time now…. 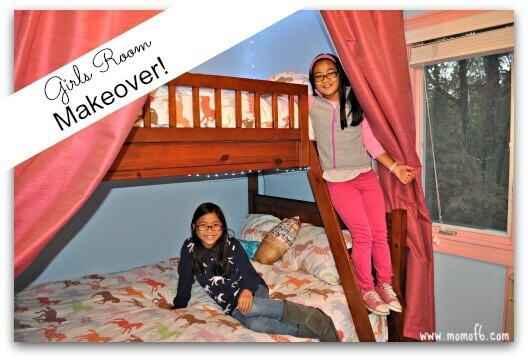 which is our girls bedroom makeover! When we moved into our new home, our girls were assigned the most “girly” bedroom in the house, painted a golden yellow shade with bright pink trim…. and…. some other girls name painted on the wall! Sure, we covered up “Miranda” with a poster of Justin Beiber….. but this was supposed to be just a temporary fix…. especially as the Beibs behavior started to go down the drain! The girls also inherited their older brothers' brown wood bunk beds with the move- and while they were happy to have bunks- they felt that they still looked like “boys beds”. Annnd… they insisted that they were getting older now and had outgrown the fairy art we had hanging in the room. “How about fairy lights around the room?” yes… please…. “What do you think of a chandelier?” “YES! PLEASE! The more we looked, the longer the list of ideas became! So Steve and I set a budget and decided to see how much we could do while staying within the boundaries of that amount. And as it tuns out…. we were able to do a lot! And the best part for me was that Steve took on the entire patching/painting the walls task himself! Because let's be honest- he does a far better job than I could ever do! Once the walls were done, we asked the girls to “move out” of their room for a few days while we worked on the details! And so we could surprise them later with a “big reveal”! We found this beautiful crystal chandelier on Amazon (*affiliate link), and while it took Steve several hours to put it together, (the entire thing arrives unassembled which is probably why it was less than $90! ), it looks amazing in the room. And since their bedroom only had one overhead recessed light, replacing it with this chandelier made the room so much brighter! Plus their room has this awesome diamond-shaped window that overlooks the front of the house, and when you come up our driveway at night and the chandelier is turned on, the whole house looks magical! Next, Steve installed the fairy lighting ,(*affiliate link) tacking it to the ceiling using command strips so it can easily be removed later when/if the girls decide they don't want it anymore. The cool thing about these lights is that they can be dimmed, can be set to flicker, and are controlled with a little remote! The girls loved the idea of enclosing their bunks with floor to ceiling drapes- so they could close off their beds like a private fort, and also as a means to block the early morning light coming through that diamond shaped window on a Saturday morning! We already owned curtain rods from the valences in their old bedroom, and we only need to drape the bed from two sides since it is already pushed into one corner of the room. We found these silky curtains on Amazon (*affiliate link) and ordered them in the 96″ length, which worked perfectly! And while I have them pulled back for these photos, in actuality- they are almost always drawn closed which is the way the girls like them! I love having the hard wood floors throughout the house, including in the bedrooms, because I love the look and how easy they are to keep clean. 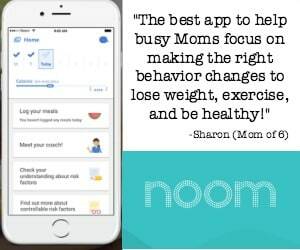 But we all know that they can be cold to step on right out of bed in the morning, and they sure don't lend themselves to curling up on the floor with a good book. I found these raspberry plush rugs on Overstock.com and placed them on top of a non-skid rug pad to keep them in place. I had considered buying a patterned rug, but decided that with the pattern on the bedding, the room would look better with a solid colored rug. It was definitely time to remove both the fairy art as well as the Beibs poster… and I knew that I wanted to replace it with something that personalized the room for the girls, but could easily be removed and changed when we wanted to update it with something new. 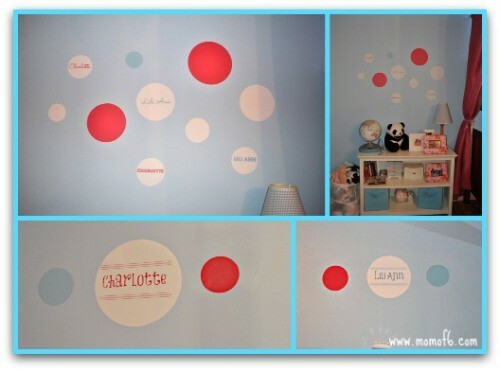 Vinyl wall decals are the perfect solution! 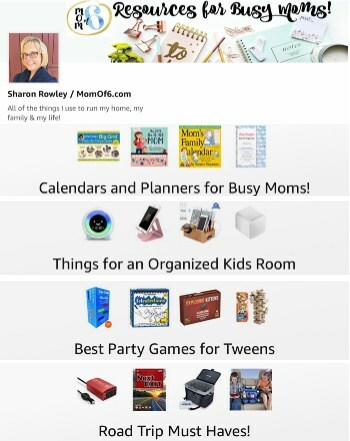 I found this awesome Circles Collection over at Pear Tree Greetings that I knew would be perfect. We already owned the bedding – a warm cozy flannel comforter cover over a down quilt, and cotton jersey bedding that doesn't wrinkle. The girls are horse fanatics- so they received this adorable Garnet Hill pony up bedding last Christmas. None of the furniture is new in their room. The bunk beds came from Pottery Barn about 10 years ago (from their “Camp” collection), the desk, chairs, bookcases, and fabric bins are all from Target. 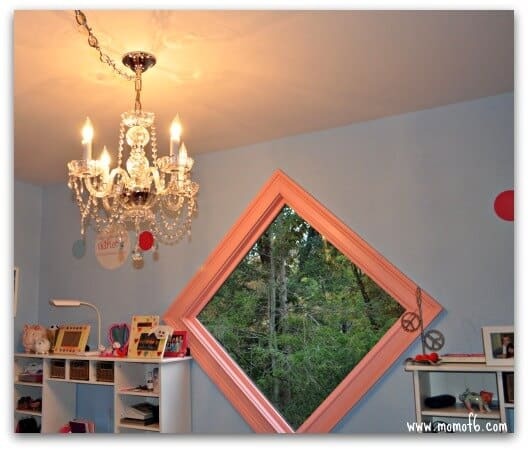 Personally I am not a fan of mirrored closet doors- I think they look a little 1970's…. 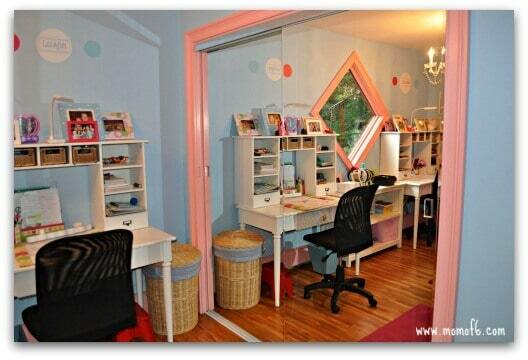 but if you are a tween girl and have the ability to see yourself in a set of mirrored closet doors? Well- there's no way those doors are going anywhere! Want to check out my video of the Girls Bedrooms Makeover? 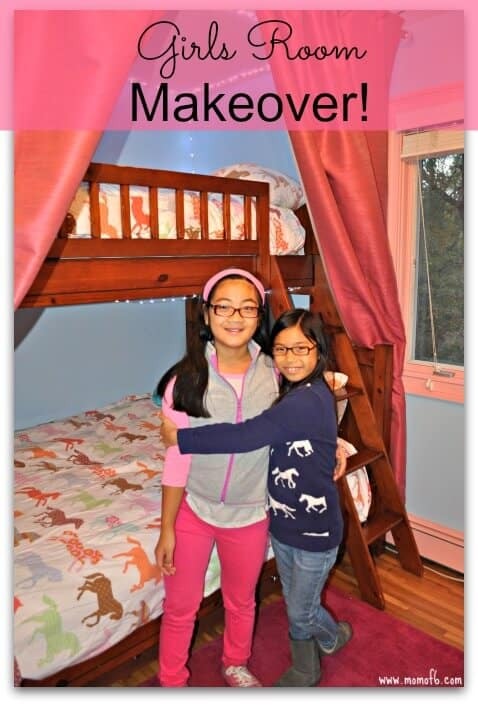 My girls are thrilled with their bedroom makeover! I would love to hear what you think too! « Dog Ownership Can Be Messy…. This turned out fantastic! I LOVE the fairy lighting and the curtains around the beds. SO fun! My girls would love that. We’re just now unpacked in our new home. Ok…that’s a lie. But, I feel like I can actually break out paint and start working on these projects myself because we have a couple of blank slates to personalize. I love how you have their desk wall set up, that diamond window is such a nice element to the room and the perfect wall for their desks. 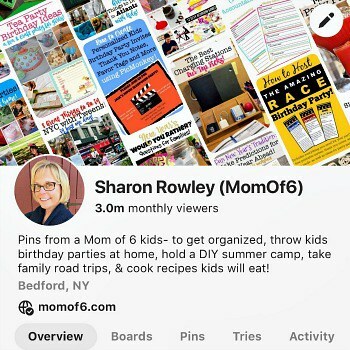 Really well done, Sharon! Let me just point out that we have been in our new home for 10 months now! And we just got to this room… so as far as I can tell, that you are even thinking about painting… you are way ahead of the game! I have another friend who was laughing at me that I had still had another’s girl’s name painted on their bedroom wall…. she just moved into her new house and painted her daughter’s bedroom the third weekend they were there! And she has 4 kids! Put me to shame! Beautiful job! 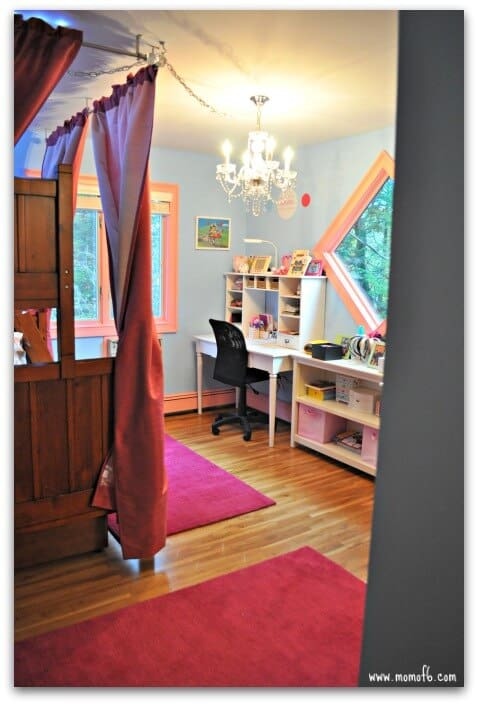 My daughter would love that room 🙂 Maybe I’ll start saving up for a chandelier for her… never thought of that for a kids’ room but it’s a great idea! That was another idea inspired by Pinterest! We actually used the recessed light fixture that was in the room to wire the chandelier, and then “strung it” further into the center of the room in order to maximize the light (the recessed light was over the top bunk). Lighting has been such an issue for us in this new home… there is minimal overhead lighting and the lamps we owned were’t cutting it. We purchased LED lamps for their desks for $20 on Amazon that at least gave us light for homework… but the room itself was so dim. The boys loft bedroom (which we plan to paint next) didn’t have an overhead lighting at all! Talk about a dark room! That’s so strange there was so little lighting in your rooms. We have the traditional 70’s square glass light fixtures in our kids’ rooms and have been looking at options to upgrade them… I can’t stop thinking about the chandelier idea now! The bedroom makeover turned out beautiful!! 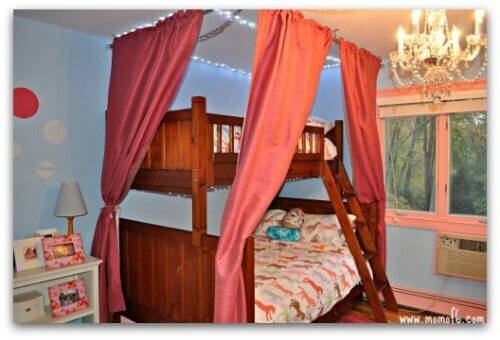 Love the curtains surrounding their bed – fun idea! 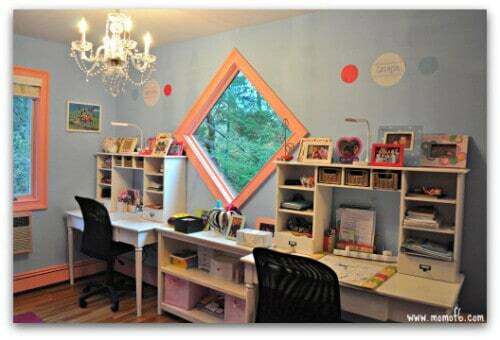 Great job with the wall decals & love the idea of putting their names on the decals and putting above their desk. Hope they enjoy their new room!! Thanks so much! I wasn’t sure at first if we should split up the art collection, but the girls wanted to give it a try- and I love how it turned out!